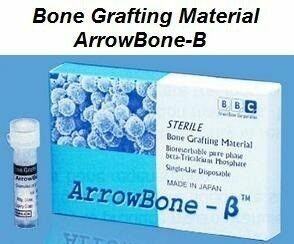 Pure phase tricalcium phosphate bone grafting material that is completely resorbable, while simultaneously enabling new bone formulation. Its unique osteoconductive granule structure with open micro-and macropores allows for faster replacement by newly formed autogenous bone. The osteoconductive scaffold stimulates cellular activity as a result of its excellent biocompatibility and due to the high purity chemical synthesis materials, potential infection risks associated with bone substitutes of biological origin are avoided.